This name uses Spanish naming customs: the first or paternal family name is Liriano and the second or maternal family name is Casillas. Pitched a no-hitter on May 3, 2011 against the Chicago White Sox. Francisco Liriano Casillas (born October 26, 1983) is a Dominican professional baseball pitcher for the Toronto Blue Jays of Major League Baseball (MLB). He is a left-handed starting pitcher and has also pitched in MLB for the Minnesota Twins, Chicago White Sox, and Pittsburgh Pirates. Liriano is a MLB All-Star, and two-time winner of the MLB Comeback Player of the Year Award. Liriano signed with the San Francisco Giants as an international free agent in 2000. He was traded to the Minnesota Twins along with pitchers Joe Nathan and Boof Bonser in exchange for catcher A. J. Pierzynski. Often compared to former teammate Johan Santana, another hard-throwing lefty, Liriano was touted as one of the "super-prospects" within the Twins organization. In 2005, he led all minor league pitchers in strikeouts, with 204. He made his major league debut in relief on September 5, 2005, against the Texas Rangers. He later joined the Twins' starting rotation and won his first game on September 30, 2005, against the Detroit Tigers. Liriano started the 2006 season in Minnesota's bullpen, but was promoted to the starting rotation in May, exchanging positions with struggling starter Carlos Silva. He won each of his first three starts. After a 12–3 start to the 2006 season, which included two Rookie of the Month nods and a spot on the American League All-Star roster, Liriano led the Major Leagues with a 2.19 ERA, statistics putting him in discussion for both the American League Cy Young and Rookie of the Year awards, but a trip to the disabled list on August 11 left him with too few innings to qualify as the league's official ERA leader and jeopardized his chances at any such awards in 2006. On August 1, 2006, Liriano was scratched from his scheduled August 2 start because of forearm inflammation after a bullpen session. He missed one start before resuming bullpen work without pain, but was placed on the disabled list after continued arm pain during his last start on August 7, 2006. Liriano began a rehabilitation program on August 22, and threw off a mound for the first time on August 30, throwing only his fastball and changeup, and said that he would like to pitch his breaking ball later that week. Liriano made a rehab start for the Rochester Red Wings on September 9, throwing 40 pitches for four strikeouts and one walk in three shutout, hitless innings. After the game, Liriano reported feeling no pain in his elbow and was reactivated by the Twins. Liriano pitching for the Twins in 2008. On April 25, 2008, Liriano was sent back to the minors after a rough start to the season coming off Tommy John surgery. In three starts, he compiled an 0–3 record with an 11.32 ERA. 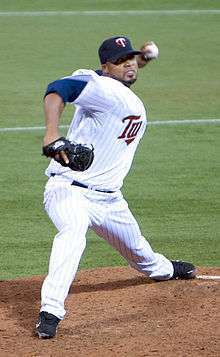 After recording an ERA of 2.67 and going 10–0 in his 11 most recent minor league starts, the Twins recalled Liriano on August 1, 2008, from Triple-A Rochester Red Wings, replacing Liván Hernández in the rotation. Hernandez was designated for assignment. In his first start after being recalled, Liriano pitched six scoreless innings and struck out five, recording the win. He then went 3–0 in his first three starts with a 1.45 ERA and 15 strikeouts in 18 2⁄3 innings. Liriano posted a less than stellar 5–13 record in 2009, with a combined ERA of 5.80. However, this was Liriano's first year since his Tommy John surgery that he had spent that entire year on the Twins major league roster. On June 28 against the St. Louis Cardinals, Liriano threw seven strong innings, only surrendering two runs. On August 12 vs Kansas City, Liriano went another seven innings, only allowing one Royals player to score a run in yet another strong outing. Between those strong flashes of brilliance though, Liriano logged several sub-par showings, frequently giving up several runs during short times on the mound. 2009 marked an up-and-down year by the LHP Francisco Liriano. During the 2009 offseason, Liriano returned to his native Dominican Republic to play winter baseball, playing for Leones del Escogido. Liriano helped his club earn a postseason berth and then went 3–1 with a 0.49 ERA in seven playoff starts, while recording 47 strikeouts and five walks in 37 innings, as Leones del Escogido won the league championship. Liriano reported to spring training lighter than usual, and Twins coaches expressed guarded optimism that Liriano had regained some of his 2006 form. The Twins considered using Liriano as a closer to replace the injured Joe Nathan, but instead he was named to the starting rotation. Liriano got off to a fast start. In Liriano's first four 2010 starts for the Twins, he posted a 3–0 W-L record, 0.93 ERA with 27 strikeouts. On May 3, 2010, he was named the American League pitcher of the month for April. Through May 18, Liriano had posted a 4–2 record and a 2.63 ERA. Liriano struggled from mid-May until the All-Star break, losing five of seven decisions. But after the break, he returned to his early season form, going 6–0 and posting seven quality starts in 10 appearances. Along the way, Liriano has posted career highs in wins and strikeouts. He finished 2010 fifth in the AL in strikeouts with 201. He was 14–10 on the year with a 3.62 ERA with 191 and 2 3⁄3 innings pitched. He was considered a Cy Young candidate by some writers as his 2.66 FIP (a defense independent pitching statistic) was second only to Cliff Lee in the American League, his 2.95 xFIP was first in the American League. Liriano started Game 1 of the 2010 American League Division Series for the Twins. He received a no-decision, pitching 5 and 2 3⁄3 innings, while giving up 6 hits and 3 walks, striking out 7, and allowing 4 runs, all earned. The Twins lost Game 1 to the New York Yankees, 6–4, and were swept 3 games to none in the series, marking the end of Liriano's season. Liriano also signed a 1-year contract after the season. Liriano struggled through his first several starts of 2011, giving up 24 earned runs in 23.2 innings through the Month of April. During this period of 5 starts, he only entered the 7th inning once. Liriano met with his pitching coach and manager after these starts and was in danger of losing his spot in the starting rotation. His fortunes changed significantly in his next start. On May 3, Liriano pitched a 1–0 no-hitter against the Chicago White Sox, throwing 123 pitches in his first complete game in 94 Major League starts. The no-hitter featured 6 walks, a high (although not record-high) number for a no-hit game. It was the first no-hitter for the Twins organization since Eric Milton accomplished the feat on September 11, 1999, against the Anaheim Angels, and the seventh official no-hitter for the franchise. After the no-hitter, Liriano made several strong appearances, including an exceptional start on June 12 against the Texas Rangers. He retired the first 19 batters in order and didn't give up a hit until the 8th inning. Liriano's performance faded later in 2011. After an exceptional outing against the New York Yankees, Liriano left his next start on August 25 after just two innings. He made his way to the disabled list with shoulder strain and did not start another game for the rest of the year. Liriano finished the season with a record of 9–10 and an ERA of 5.09. Liriano pitched a four-strikeout inning in the fourth inning of the Twins' game against the Kansas City Royals on June 5, 2012. On July 13, he struck out 15 batters in a loss to the Oakland Athletics, topping his career high of 12 strikeouts. In 22 games (17 starts) with the Twins in 2012 before he was traded, Liriano went 3-10 with a 5.31 ERA and 109 strikeouts. 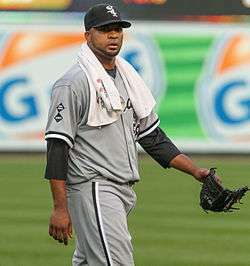 On July 28, 2012, Liriano was traded to the Chicago White Sox in exchange for Eduardo Escobar and Pedro Hernández. As Liriano struggled with the command of his pitches, the White Sox removed Liriano from the rotation in September. In 12 games (11 starts) with the White Sox, Liriano went 3-2 with a 5.40 ERA. Liriano agreed to a two-year contract with the Pittsburgh Pirates on December 21, 2012. The contract was voided shortly after as Liriano suffered an injury to his non-throwing arm and failed his physical , he broke his non-throwing arm while he tried to scare his kids on Christmas. A new two-year deal was reached between the Pirates and Liriano and became official on February 8, 2013. Liriano started the 2013 season on the Pirates's 15-day disabled list. Liriano made his debut on May 11 against the New York Mets. Liriano's improved command by changing his pitching mechanics led to a career rebirth with Pittsburgh. Liriano finished his 2013 campaign with a record of 16-8, an ERA of 3.02, and 163 strikeouts. In the Pirates' first playoff game in 21 years, Liriano gave up one run and four hits in 7.0 innings while earning the win as the Pirates defeated the Reds 6-2 in the NL Wild Card game. On November 4, 2013, Liriano was named the 2013 NL Comeback Player of the Year for his bounce back year. Liriano struggled greatly in the first half of the season, going 1-7 with a 4.72 ERA in 15 starts at the All Star break. However, Liriano would reclaim his dominance of 2013 in the second half of the season, going 6-3 with a 2.20 ERA in 14 starts to end the season. Overall, Liriano posted another strong season in 2014, going 7-10 with a 3.38 ERA and 175 strikeouts in 29 starts. On December 9, 2014, Liriano re-signed with the Pirates on a 3-year, $39MM contract. Liriano continued his success from his previous seasons, striking out a career high 205 and going 12-7 for the Pirates. Liriano struggled throughout the season with bouts of wildness. In 21 starts with the Pirates, Liriano pitched to a 6–11 record, 5.46 ERA, 116 strikeouts and 69 walks through 113 2⁄3 innings. On August 1, 2016, the Pirates traded Liriano along with Reese McGuire and Harold Ramírez to the Toronto Blue Jays for Drew Hutchison. While it was initially believed that Liriano would replace Aaron Sanchez in the rotation due to the organization's desire to limit Sanchez's workload, general manager Ross Atkins announced on August 4 that the Blue Jays would use a six-man rotation going forward. Liriano made his debut with the Blue Jays on August 5, pitching six innings against the Kansas City Royals and yielding two earned runs in a 4–3 win. He made eight starts and two relief appearances with the Blue Jays in the regular season, and posted a 2–2 record, 2.92 ERA, and 52 strikeouts in 49 1⁄3 innings. In the Wild Card game, Liriano entered in relief in the 10th inning and retired all 5 of the batters he faced. He and took the win after Edwin Encarnación's walk-off home run in the eleventh inning. During the eighth inning in the second game of the ALDS, Rangers outfielder Carlos Gómez hit a 102-mph line drive single that struck Liriano near the back of the head. Liriano was taken to a local hospital for examination, and cleared to return to Toronto with his teammates. Liriano is a four-pitch pitcher. To left-handed hitters he throws a four-seam fastball, a two-seam fastball (both averaging about 93 mph), and a slider (mid 80s). Against right-handers, he adds a mid-80s changeup. More than half of his pitches with 2 strikes are sliders, perhaps due to the relatively high whiff rate — 43% over his career. He has one of the league's highest whiff rates on a slider with 2 strikes. Liriano has been a strikeout pitcher throughout his career, averaging better than one strikeout per inning through May 2016. As a member of the Rochester Red Wings, Minnesota's Triple-A farm club, Liriano was awarded International League Rookie of the Year in 2005. Shared the American League Rookie of the Month for June 2006 in a Twins' sweep of the AL monthly awards, with Johan Santana named Pitcher of the Month and Twins' catcher Joe Mauer Player of the Month. Named by American League manager Ozzie Guillén as one of five candidates for the 2006 All-Star Final Vote. Liriano finished second to the player he was traded for, A. J. Pierzynski. On July 10, 2006, Liriano was named to his first All-Star game by American League Manager Ozzie Guillén to replace fatigued starting pitcher José Contreras. Named American League Rookie of the Month July 2006, his second consecutive such award. Named American League Pitcher of the Month for April 2010, after posting a 3–0 record and leading the league with a 0.96 ERA. On May 3, 2011, Liriano threw his first career complete game, a no-hitter against the Chicago White Sox at U.S. Cellular Field. He had 6 walks and 2 strikeouts in the 30 batters he faced. He threw 123 pitches, 66 of which were strikes. On July 13, 2012, Liriano struck out 15 batters against the Oakland A's. He caused 27 swing and misses, the highest number since 2007. Named Opening Day starter for the Pirates in 2014, 2015 and 2016. Liriano's arrival in the United States for 2008 Spring training was delayed due to visa problems caused by a prior drunk driving arrest in 2006. Francisco and Johanna Liriano became parents to Kevin Liriano on April 4, 2008. Liriano is the first cousin of San Francisco Giants pitcher Santiago Casilla. ↑ "Giants give up Nathan in deal for catcher". Espn.com. November 15, 2003. Retrieved September 20, 2013. ↑ "Batting Leaders – Baseball-Reference.com". Minors.baseball-reference.com. Retrieved September 20, 2011. ↑ Sullivan, T.R. (August 2, 2006). "Liriano scratched from start with pain Left-hander taking precautionary measures". MLB.com. Retrieved January 13, 2009. ↑ Nystrom, Thor (August 1, 2008). "Twins recall Liriano from Triple-A Hernandez, Monroe designated for assignment in move". MLB.com. Retrieved January 13, 2009. ↑ "August 3, Minnesota-Cleveland Box Score". Mlb.mlb.com. August 3, 2008. Retrieved September 20, 2011. ↑ "Liriano Is Lost in the Cy Young World | FanGraphs Baseball". Fangraphs.com. September 14, 2010. Retrieved September 20, 2011. ↑ Neyer, Rob. "Twins' Liriano deserving ... but will lose - SweetSpot Blog - ESPN". Espn.go.com. Retrieved September 20, 2011. ↑ "Award Crowdsourcing: AL Cy Young | FanGraphs Baseball". Fangraphs.com. September 10, 2010. Retrieved September 20, 2011. ↑ "THE BOOK-Playing The Percentages In Baseball". Insidethebook.com. November 17, 2010. Retrieved September 20, 2011. ↑ "Boxscore: NY Yankees vs. Minnesota – October 6, 2010". Mlb.com. October 6, 2010. Retrieved September 20, 2011. ↑ "Twins' Liriano throws no-hitter in victory over White Sox". Tsn.ca. May 4, 2011. Retrieved September 20, 2011. ↑ "White Sox Acquire Francisco Liriano". Chicago.whitesox.mlb.com. Retrieved April 2, 2013. ↑ "Pirates to Sign Francisco Liriano". Piratesprospects.com. December 21, 2012. Retrieved April 2, 2013. ↑ Nowak, Joey (January 21, 2013). "Report: Pirates, Liriano agree to new deal". MLB.com. Retrieved January 21, 2013. ↑ Gleeman, Aaron (February 8, 2013). "Six weeks later, Francisco Liriano's deal with the Pirates is now official". NBCSports.com. Retrieved February 8, 2013. 1 2 3 "Francisco Liriano Statistics and History". Baseball-Reference.com. Retrieved October 4, 2016. ↑ "Blue Jays trade Drew Hutchison to Pirates for Francisco Liriano, prospects". Sportsnet. August 1, 2016. Retrieved August 1, 2016. ↑ Chisholm, Gregor (August 4, 2016). "Blue Jays to keep Sanchez in 6-man rotation". MLB.com. Retrieved August 5, 2016. ↑ Zwelling, Arden (August 5, 2016). "Liriano gives Blue jays plenty to ponder after solid debut". Sportsnet. Retrieved August 6, 2016. ↑ Davidi, Shi (October 4, 2016). "Encarnacion adds signature moment as Blue Jays advance". Sportsnet. Retrieved October 5, 2016. ↑ Davidi, Shi (October 7, 2016). "Blue Jays' Liriano cleared to fly back to Toronto". Sportsnet. Retrieved October 8, 2016. ↑ "Brooks Baseball · Home of the PitchFX Tool - Player Card: Francisco Liriano". Brooks Baseball. Retrieved May 30, 2012. ↑ "PitchFX Leaderboards". Baseball Prospectus. Retrieved September 25, 2012. ↑ "Robinson Cano, Francisco Liriano take the American League's monthlies". Mlb.mlb.com. Retrieved September 20, 2011. ↑ "Pittsburgh Pirates Name Opening Day Starter". ↑ "Liriano's visa held up by 2006 drunken driving arrest". Sports.espn.go.com. February 15, 2008. Retrieved September 20, 2011. Wikimedia Commons has media related to Francisco Liriano.